Lincoln, Nebraska, is abortion-free until further notice. A longtime Planned Parenthood abortionist, who was the sole provider of abortions in the city, left unexpectedly at the end of March. The departure of the abortionist came just days after Operation Rescue received a letter of confirmation that the Lincoln Planned Parenthood facility is under investigation. Operation Rescue had filed a complaint against the center for unsafe conditions after receiving photos from a confidential informant, showing that the area outside the ambulance entrance is completely unreachable. According to Operation Rescue, besides piles of dirt and construction debris blocking the door, there is a 6-foot-deep trench directly in front of the entrance, making it difficult – if not impossible – for timely help to arrive for patients in an emergency situation. The letter confirming the investigation of the Planned Parenthood facility for unsafe conditions was received by Operation Rescue on March 27; word spread of the abortionist’s departure in early April. Angie Remington, a Planned Parenthood spokeswoman, hopes the time without an abortionist in Lincoln will be short – no more than a few weeks. According to Live Well Nebraska, Remington said another abortionist will begin providing abortions as soon as she renews her Nebraska credentials. No explanation was given by Planned Parenthood as to why the abortionist left, citing confidentiality. “One of the abortion industry’s biggest fears has hit Planned Parenthood of the Heartland (PPH): the dwindling number of people who agree to kill unborn babies for a living,” Julie Schmit-Albin, executive director of Nebraska Right to Life, told Life News. Nebraska has abortion facilities at three other locations, including another city where the former Lincoln abortionist also practiced. LeRoy Carhart talking about what happens to babies he aborts. 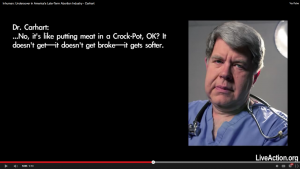 In neighboring Bellevue, notorious abortionist Dr. LeRoy Carhart works from his practice. Carhart has a horrific and heartbreaking history of gross negligence, and is being investigated for the February 2013 death of a patient. “We pray the Lincoln facility will remain abortion free and it is only a matter of time before PPH cannot do abortions in Omaha,” said Schmit-Albin.